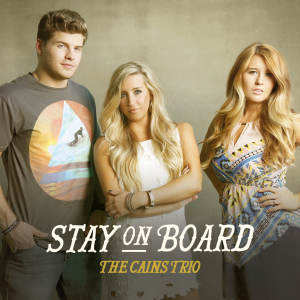 The Cains Trio, a sibling group from Hartselle, Ala., will be releasing their debut CD on Oct. 28. The album is called “Stay On Board”. I didn’t refer to it as their debut ‘country’ CD, because I’m not really sure in which genre’ this trio belongs. What I do know, is that they have put out some great music. The best way to describe the sound to you, is to use their words. They said they are a “combination of country, soul and pop to Americana, folk and contemporary Christian”. What I know, is that it is a good combination, and a refreshing new sound. Taylor, Madison and Logan Cain produce a quiet, mellow, soft sound. And, they use that sound to give us some great music! Their bio tells us that they are much more than singer/songwriters – they are also multifaceted entertainers and musicians who play guitar, piano, bass, harmonica and more. It all started when eldest sibling, Taylor, learned her first song on the piano at 5-years-old, and a few years later began teaching her young siblings to sing harmony with her. Now, all Troy University graduates, the siblings are ready to show the world those harmonies and pursue their dream. Most of the songs on the album are slow to mid-tempo. I think “Traveling Kind” was really the fastest song on the CD, and it’s not fast… not like some of the music out there today. But, it’s all good. Each song is different from the one before it, and every song is relaxing, yet thought-provoking. My favorites are “Say Less, Love More”, “Stay on Board,” and “Be Yourself With Me”. These are great lyrics, great melodies, without a doubt great harmonies – and everything needed to make a great album. Here are the 10 songs you’ll hear on the new album: Be Yourself With Me, Smoke on the Hill, I’ll Take That Any Day, Someone Loves You, She’s My Girl, Fighting For Love, Beautiful Life, Traveling Kind, Say Less, Love More, and Stay on Board. Below is the press release about this new trip, and their new CD.